From the port it is about 25 minutes walk to the start of Las Ramblas. The ships dock close to the center but you must first cross a bridge to get to the main land. At the end of the road, at the huge round-about turn right. After about 1 kilometer you will arrive at Placa de la Carbonera. Continue along the water. At the next round-about (Placa del Portal de la Pau) cross the street and you will find yourself at the beginning of La Rambla, probably Barcelona's most popular street. - La Rambla - probably the most famous street in Barcelona, if not in all of Spain. It is always crowded with tourists. On this street you will find many shops, souveniers stands, markets and also street artists doing their best to attract a crowd. Beware of pick pockets when you walk on this street. - Guell Park - one of Gaudi's masterpieces. This park is part of UNESCO world heritage. - Casa Mila (La Pedrera) - another one of Gaudi's famous works. This building from 1910 attracts a lot of tourists due to its unconventional design. - Placa de Catalunya - Barcelona's busiest square located at the end of La Rambla. Surrounded by beautiful buildings, this square is used by many locals to relax and socialize. - Torre Agbar - a modern building you wont miss. This is one of Barcelona's tallest buildings that lights up at night. - La Seu Cathedral - located in the heart of the gothic distric (Barri Gòtic), this cathedral completed in 1460 attracts many tourists. 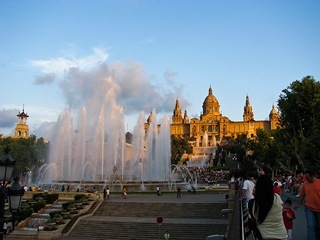 - Aquarium - located quite close to the waterfront, the Barcelona Aquarium features many exotic fish and other sea life. This is a good alternative for a rainy day or just to escape the burning sun for an hour. Barcelona is home to one of the world's best soccer teams, FC Barcelona. They play their home matches at the immense Camp Nou stadium which has a capacity of over 100.000. Espanyol is also from Barcelona and plays their home matches in the Olympic Stadium. Average temperature: around 25 Celsius in summer, around 10-15 in winter. Smoking: generally prohibited in public areas. Some restaurants and bars have smoking areas. The region of Catalonia has a strong culinairy reputation. The 'local' food usually has one or more of the basic ingredients like olive oil, garlic and tomato. You will also find many dishes with seafood, the most popular being Paella. Bread is served with most dishes. In Spain it is normal to eat dinner at 9PM or even later. Everythings happens a few hours later than most of us are accustomed to. Breakfast is not all that important to the locals, they usually start the day with a strong coffee at 10AM and then lunch at 2/3PM or so. Lunch is by far their most important meal of the day. After lunch they retreat for a few hours after which the start the day again at 5 or 6PM till late. 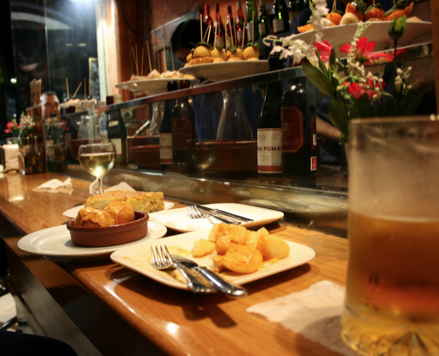 All types of drinks are available in Barcelona but if you are looking for a local drink ask for a granizado or orxata. They are popular soft drinks/juices. A granizado is juice or coffee with crushed ice and orxata is a typical papyrus juice. Cerveza (beer) and wines are also very popular. The most popular eers in Spain are Estrella, San Miguel and Mahou. The most popular local beers include Moritz and Rosita (brewed close to Barcelona). This beer comes in a lager, ale and stout. The local red wines have a full body and have a strong but smooth flavor. Culinary Barcelona is definetely top quality. You will not be disappointed. Barcelona offers a great variety of interesting places to visit. This mid-sized mediterranean city combines a strong sense of modernity with its two thousand years of history, and architecture is one of its strongests points. Barcelona's most famous street connects the port with Plaça de Catalunya, dividing the Gothic Quarter and the Raval. Once the place to see and be seen for Barcelona citizens, the promenade offers an extraordinary variety of human types in constant activity, day and night. Do not miss the Boqueria food market and the Gran Teatre del Liceu, Barcelona's Opera theater. The city in its original essence, dating from the Roman period. Walk through the twisty streets, plenty of boutiques and antique or artisan galleries. Its most emblematic places are the Cathedral, the Plaça del Rei, Plaça Sant Jaume and Santa Maria del Mar church, the best example of Catalan gothic style. This neighborhood shows a good example of urban planification. Here are located the best buildings of the 19th century Catalan bourgeoisie. Don't miss some of Gaudí's best known works, like La Pedrera, Casa Batlló and, of course, the Sagrada Família, but also lots of other less known but still interesting modernist buildings. Take a walk along Passeig de Gràcia, north of Plaça de Catalunya to find the most exclusive shops, galleries and restaurants. An old fishing district, now back in fashion while retaining its character. Located next to one of the best city beaches, its narrow streets are full of small restaurants and tapas bars. Next to the Barceloneta, you find the Poble Nou district with the Olímpic Village, completely renewed on occasion of the 1992 Olympic Games. Rising only 700 ft. above the city's commercial port, this little mountain was not urbanized until 1929 for the Universal Expo. Since then It has hosted many other events, ranging from F-1 races to the Olympic Games. Now is full of gardens, museums and spectacular views. 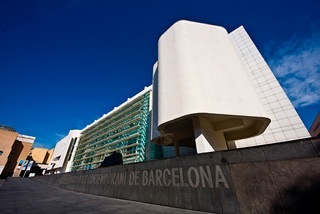 Not to miss, the Museu Nacional d'Art de Catalunya (MNAC) and the Fundació Joan Miró. 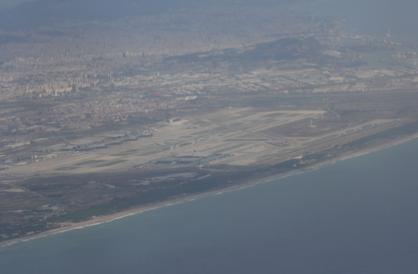 Barcelona International Airport (BCN) or El Prat airport is located 12km away from the center. El Prat has two terminals. Terminal 1 has just been refurbished (2009). Terminal 2 is somewhat older and today mainly caters to low budget carriers. Iberia is Spain's national airline. Vueling is their most popular low cost airline. Barcelona (El Prat) airport with the city of Barcelona in the background. Barcelona is connected to most major European cities. El Prat also serves various cities in North and South America, Africa and Asia. To the US, direct flights are available from New York JFK, Miami, Philadelphia and Atlanta. The easiest way to get to Barcelona is by taxi. We would definitely recommend a taxi if you are going with luggage to the port. Taxi fare will range from 20-30 euro's. Journey time is about half an hour depending on traffic. There is also a train connecting El Prat (T2) to the center of Barcelona (about 2.60€ one way). From here there is direct access to the Barcelona metro system. There are also buses to the center. Public bus line 46 will take you to the center but there are also private buses (Aerobus) that will take you directly to Placa Catalunya. These are faster, more comfortable but are also a bit more expensive (about 4€ one way). It shows the general history of Catalan art from the Romanesque period to the mid-twentieth century. Romanesque and Gothic collections are mostly from Catalan provenance, although, particularly in the Gothic, comparisons are made with art from other places. Renaissance and Baroque collections, take a more international discourse, with the work of great painters, such as El Greco, Zurbarán, Velázquez, Cranach, Rubens... The end of the nineteenth century and the early decades of the twentieth century are once again represented by Catalan artists, explaining Modernisme, Noucentisme and the Avant-garde, always taking into account all the arts. Contemporary art in a diverse range of visions.The Collection starts with the materic abstraction of the fifties and follows the evolution of European pop, the avant-gardes of the sixties and seventies, the centrality of the word and poetic experience and the return of photographic figurative representation, and anti-minimalist sculpture in the eighties, before reaching today’s younger artists. A key reference for understanding the formative years of Pablo Ruiz Picasso. The permanent collection contains 4.249 works that reveal the genius of the young artist from 1917, the Blue period and the series Las Meninas being the most representative of them. The Foundation holds an exceptionally comprehensive collection of works by Joan Miró.The collection currently comprises over 14,000 pieces, mostly donated to the Foundation by Joan Miró himself. 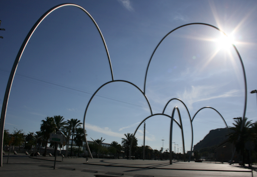 The Foundation building, designed by Joan Miró close friend Josep Lluís Sert, is a great example of modern mediterranean architcture. The word Catalunya (Catalonia) emerged at virtually the same time as Catalan was first used in writing, around the 11th century. Take a look at our history, from our roots in the Iberian culture, the influx of ancient Greeks and the Roman Empire, and much, much more explained in a comprehensive way. The museum building is located at the port of the city. 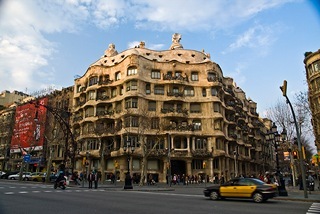 Built by Antoni Gaudí between 1904 and 1906, nowadays the spectacular facade is an iconic landmark in the city. The house, now a museum, is open to the public, both for cultural visits and for celebrating events in its splendid modernist function rooms. Casa Milà, popularly known as ‘La Pedrera’, was constructed between 1906 and 1912. It is Antoni Gaudí last civil work and one of the most innovatory in its functional, constructive and ornamental aspects. Always considered a breakthrough work that anticipated the architecture of the 20th century, it was declared UNESCO World Heritage in 1984. Internet is widely available throughtout the city. Wireless access points are available in many stores, restaurants, hotels and pubs. There is however also a city WiFi access service under the name of Barcelona WiFi. This is a free service but the connection might be a bit slow. The numer of hotspots throughout the city is growing continuously creating better coverage. The weather in Barcelona is mild to hot. Spring and autumn are the best times to visit and to be active. Summer can be quite hot and humid. Barcelona receives very little rain.